This last couple of days have been slightly mad, I will admit it. James and I just flew in L.A after 48hours spent in Beijing. This back and forth trip kind of gripped us by the bones but it was so worth it from beginning till end. We’ve been to China already several times, Shanghai more precisely, but Beijing was our first time. And I loved it even more. We visited so many beautiful places, even though our stay was so short, tried so many local dishes, met so many lovely readers. I had the best time ever. Now we are back in L.A and back to WERK! I’ve spent my week-end working essentially, Saturday was a big shooting day for us (can’t wait to tell you more about it) but Sunday was all about fun. We decided to enjoy ourselves after a bit of a hectic time and spend a peaceful moment with friends over brunch, wine, a view and movies. Simply the best schedule we could have ever planned. Now that the week is kicking off, the only thing I can think about is hitting the studio again after this super enjoyable post fashion week break. I’ve been songwriting and singing from morning till evening all these days and simply can’t wait to put it all down on paper and tape. The weather in L.A right now feels like absolute summer, which is so crazy! I sometimes forget what a bubble of paradise California is and how cold it is in the rest of the world. My friends from New York for example keep saying how insanely cold it still is. These last couple of days have been so warm here in West Hollywood but from time to time a little wind shows up and I have to say that a jacket or trench coat always comes in handy. I am super excited to share with you today a look that I’ve created while working together with the Michael Kors team. After attending their show during NYFW I felt so inspired by their super effortless, city inspired aesthetic that I wanted to create my own interpretation of it. So before we left to China, we shot some of the pieces from the new Michael Michael Kors spring collection and their ‘must have’ accessories for the season. You, know, throwing in a little “Jet Set” vibe here and there ;) This look is kind of all about feeling and looking super laidback, but looking chic at the same time. I’ve always felt like a trench coat had this amazing ability to elevate any outfit. Also wanted to throw in there a little denim detail with this fringy top and a versatile bag that you can fit your whole life into (just cause we all need room for our on-the-go essentials!!!). This bag is called the Riley. I have a big thing for white bags this spring. Don’t even ask me why. I just love them. My other favorite item are definitely the boots as they are so comfy and look so casual and effortless. They’re part of the new Michael Michael Kors ‘Jet Set 6’ shoe collection which is all about mixing up comfort and elegance. I say thumbs up. Perfect if you’re moving and travelling all the time (gotta keep it busy!). So folks don’t miss out on checking out all of their cute spring essentials and let me know what you think about this outfit. Speak to you all super soon! Loving it! I absolutely LOVE wearing trenchcoats. They are so classy and never go out of style! 48h en Chine, ça doit être fatigant mais c'est top ! your coat ist just amazing! I love the top the most! So chic! We are missing posts from you. That denim top is fantastic! Love this look! Your life sounds absolutely crazy - China for 48 hours just sounds insane but so amazing! Enjoy working on your music. You're so beautiful! Love your trench and the boots! I see your style is slowly but surely transitioning into Los Angeles street style. Keep it up, you're doing awesome! this look is soo perfect! Gorgeous outfit!! I love the denim top SO much! Heey, where are the jeans from? magnifique ......tenue décontractée et chic en même temps ! bottines un peu trop grande pour ton pied ??? très belles en tout cas ! sac blanc facile à porter et possibilité ranger pleins d' objets utiles ! bravo à tous les deux ! sous le soleil , exactement ......sous le soleil .....! à +. Natasha | Ok, Last Bite. Those boots are absolutely darling, that color! I saw your travel posts on instagram and couldn't believe how much you jet around the world and still manage to be so energetic and absolutely gorgeous. way to go girl, major inspiration! You look absolutely gorgeous! Love your bag! Ta tenue est parfaite! J'adore ton top en jean, ça donne un côté 70s à la tenue, c'est super chic! J'ai hâte à la sortie de ton livre, je ne l'ai pas encore précommander mais ça ne saurait tarder! J'adore ta façon d'écrire donc je suppose que ton livre va être génial! Amazing look! Love the jeans blouse! You look absolutely gorgeous!! Your trench and bag are perfect pieces!! Such a cute outfit! Love the denim crop top! I love the jeans top under the trench coat! It makes the whole look a little more youthful! Your trip to China sounds amazing! This look is so sleek and minimal! I'm obsessed with that denim top and am completely falling in love with trench coats right now! Perfect! That Trench coat is so beautiful, like it so much! I'm in love with your Michael Kors trench, it looks really gorgeous on you ! You look really chic and elegant as usual! Michael Kors looks great on you! I would kill to travel as much as you do!-hopefully the job I am aiming for will allow me to do so! Once again perfect blog post - you are really so amazing!!! Is the trenchcoat already available? Because I'm in love with this jacket!! Love the simplicity of this look! Just stunning! It sounds like you have had a very intense couple of days! I am so in love with your bag here, it is such a great size. amazing, glad to hear you actually had a moment to relax! you look like you never stop haha! Love the whole outfit!! Looking so causal yet chic! Love the top so much! Lovely outfit! Its a perfect outfit for travelling. I love the trench especially. Love the trench coat and denim detail! I think it's definitely a must have for spring along with pastels. My heart aches for a gold ol' trusty trench coat to come join my closet! Wonderful look - love your Michael Kors outfit. nice look! lovely top and bag! I love your spring look! And the shoes are so cool! How do you overcome the fact that people stare at you whilst you're taking photos for your blog in the streets? This trench is simply gorgeous. In love! Nice outfit, so relaxed. You are gorgeous regardless of what you're wearing. You look so beautiful in that trench coat! I definitely need to invest in a good classic one as well. And btw, that denim crop top is everything! It matches your eye colour and makes me think of daisy dukes, hot california weather and barbie-pink details. Thanks for sharing your jetsetting journey! Love your style. Stunning photos as always! I really like the mix of neutrals here. That blue crop shirt is amazing! I can think of so many different things it would look good with. I love this whole look! What a fun top, Kristina! I bet you are singing your heart out now that you're back in LA. I LOVED the new Cartier video you put up on Instagram. Such an iconic brand and a timeless piece! I have my eye set on the white one. Someday I'll be able to nab me a wonderful and classic piece like that! I can't wait to see the post around this collaboration! I saw the behind the scenes pictures and videos on your snapchat and i am beyond excited to see the final result! loved the post (as always). this long coat really does long amazing! All my love from South Africa! I love that MK bag, it looks fabulous. Love your blog! its truly an inspiration! Great look, love your boots! Such a pretty look! The coat and the boots look so classy and chic! Adore this look Kristina! So effortless and chic. Especially love the trench coat! Hope you get some good rest!! You are traveling like CRAZY!!! You look amazing with this natural kind of makeup. Love the photos! Oh, I really love it! Check out my new post on my blog about Easter Decoration! This is such a lovely outfit once again ! Love the denim cropped top, along with the trench and white jeans, fabulous mix !! I am so jealous that you get to experience the fabulous weather in LA, in Paris it's awful ! Is there a direct link to your bag pants and boots? I was having trouble finding it on the website. Otherwise, great photos and glad that you've been spending so much time working on your music. I noticed that you took down your YouTube video of you singing so I can't wait to see the updated musical you. I love your photos they are amazing and so are you! Love the coat and bless you, you are soo busy; great work ethic. What a nice photography , I love they color of your coat. Keep up the good work, and enjoy your easter weekend. Loving the shoes and the trench! The denim fringe top is great! I love how it's kind of unexpected too. J'adore ce truc super élégant! Les boots sont très sympas aussi, pourtant je ne suis pas une adepte de Michael Michael Kors, trop "strict" à mon goût! Your makeup is on point in this shoot, I love how both your outfit and your makeup looks so effortless and minimal, but still very put-together. It definitely embodies the whole "on-the-go-but-I-still-look-good" feel. I very love your Boots! Traveling must be so amazing. You're so lucky you love what you do. And you're so pretty too. It's like you're living a perfect life. So perfect, I'm loving the trench coat! Always running from one country to another has to be tiring, right? I love Beijing - definitely worth a visit! You are just SUCH an inspiration for me! You look stunning in natural makeup and a top knot! Could definitely get used to that wheater, Sweden is almost like winter still... gah. Kristina you look beautiful in this simple but yet so stylish outfit! Lovely Trenchcoat!!! a love the combination! the hole outfit is just perfect! you have such an eye! I'm totally in love with this coat !!! I would never have put all those things together but they totally work! Thanks for helping me think outside the box! What an amazing experience, Beijing is such a great place to visit! You are so elegant and stylish. Your style is recognizable and laconic. You look absolutely breathtaking! Love the trench coat! you look amazing Kristina, I love everything about this outfit! This looks like something you will not wear. I´m sorry Kristina but since you started living in LA I think your style just changed a loot! And you stopped being as Classy and chic as you was. Please watch your articles on the last years; and remember what makes you the huge blogger you are. Your instagram is getting full of images that you look good but it is like anymore about fashion. that denim fringe top is such an amazing garment! You've styled it beautifully. You look stunning! This coat is so amazing! Great pictures! You can check out my navy blue look. Have a great week! love the coat and the boots! Perfect trench. You look great. the coat is so pretty! :) lovely photos! Lovely combination. Great to be in LA! Loving your fresh faced makeup look! Glad you had a great trip to China! You look fab!! I'm in love with your boots! love love love this looks - you look aamzing as per usual ! Perfect look all based on neutral nuance, the trench is so nice! NEW BLOG POST!! Today we talk about "TREND ALERT: CULOTTES" - Fashionista's new favorite pants!! Options & looks of 2015 spring trend!! Check it out!! das Outfit steht dir richtig gut. Der Mantel ist ja der HAMMER! Muss gleich schauen ob ich ihn selbst im Online Shop finde. I do love your casual look.. It was stunning. Gorgeous as always! Simple and chic at the same time - great combination! Traveling is indeed very tiring ! plus jet lag omg urrrh, loving the look !! Love the Jet set look! Perfect for the days you just want to get casual! Bonjour ! Please, I'm really really in love with u, and with what u do. Je voudrai te demander si cela pour t'être possible de créer un snapchat version French. Il y a tellement de Française que tu suivent. And it just make so happy to hear sometime some french words from you or James voice. I love that trench coat, I need a good trench in my life! Yes to the trench and the bag ! Suits you perfectly, as always. And it's actually so unusual to see you without your heels ! 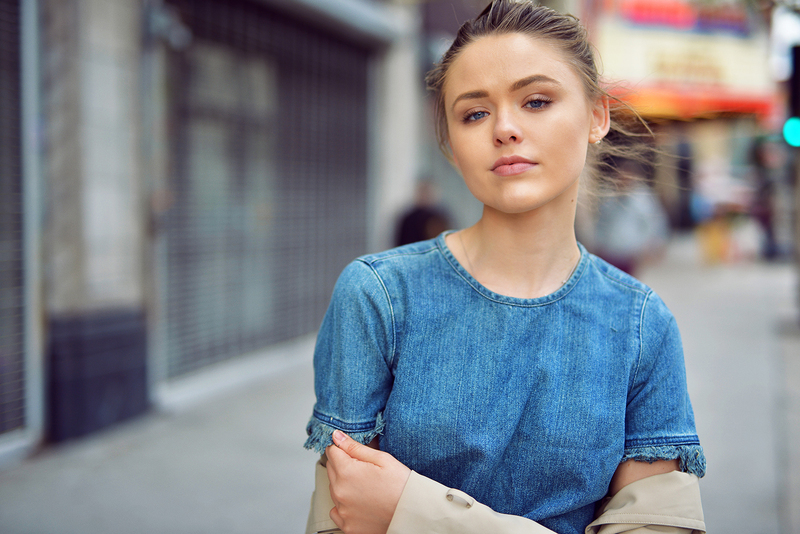 your denim top is everything! What a great coat :) and the color is great!